Physical activity can help us retain flexibility and improve our range of motion which will benefit your body in the long run. Less aches and pains, and promotion of blood moving through the body. Who wouldn’t want to feel better instead of like they’re falling apart? 1. 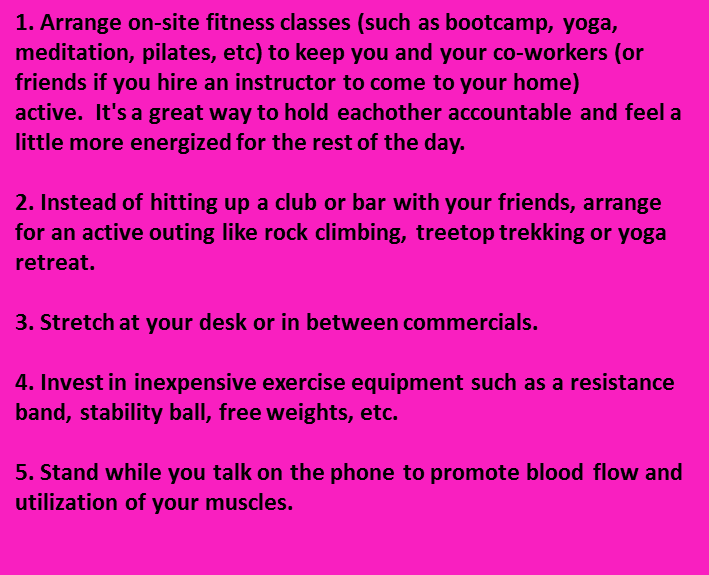 Arrange on-site fitness classes (such as bootcamp, yoga, meditation, pilates, etc) to keep you and your co-workers (or friends if you hire an instructor to come to your home) active. It’s a great way to hold eachother accountable and feel a little more energized for the rest of the day. 2. Instead of hitting up a club or bar with your friends, arrange for an active outing like rock climbing, treetop trekking or yoga retreat. 3. Stretch at your desk or in between commercials. 4. Invest in inexpensive exercise equipment such as a resistance band, stability ball, free weights, etc. 5. Stand while you talk on the phone to promote blood flow and utilization of your muscles.